By now, everyone has at least heard of the huge disaster of a festival that never was. For those of you who don’t know, the Fyre Music Festival was supposed to be the festival to end all festivals. A deserted tropical island in the Bahamas, the most famous influencers, and an exclusive guest list, all for the mere cost of an engagement ring. The VIP package was to include the most luxurious of treatments, gourmet meals, and villas to sleep in. Whether you were following the trending topic on Twitter, back in April of 2017, or have recently binge watched the documentaries on Netflix or Hulu, you couldn’t ignore the urge to google “Ja Rule, where is he now?” Ja Rule and the other master minds behind the festival are now facing major lawsuits for fraud. Our fascination with The Fyre Festival stems from the amazing marketing campaign that came before the disaster. The Fyre team did absolutely everything right from a marketing perspective and we’ll go into what that entails below, and then further discuss why at the end of the day it was all a waste. In marketing, it’s crucial to know who exactly it is you’re trying to reach. Once that has been determined, you can create your marketing plan. The Fyre team wanted to create the ultimate experience for millennials by hosting two 3-day music festivals full of the most prominent performers, and trendiest influencers, with luxurious accommodations on a Bahamian island. The team had the dates and the location picked (or so they thought) and had their target audience nailed, then they began attempting to execute their marketing plan. We can all admit, we’ve bought a product or visited a restaurant based on a sponsored post by a celebrity we follow on social media. As silly as it may be, it’s a very real and a crucial piece of marketing in today’s society. In fact, 70% of millennial consumers are influenced by the recommendations of their peers in buying decisions, as reported by Collective Bias. Fyre took this statistic and ran with it. They utilized multiple different Instagram personalities to create a viral sensation around the announcement of Fyre. First, they invited these Instagram influencers to the island that would be the proposed site of the festival. Then they filmed an absolutely incredible promotional video. The video created an atmosphere that every single millennial would want to partake in, they created an experience rather than a product. Since there are so many influential millennials with such a large following on social media, it was smart to use them as their voice to introduce the festival. Then, Fyre executed a seamless Instagram campaign with these same influencers, with one notable addition – Kendall Jenner, who alone has over 100 million followers. All these influencers posted a solid orange post on Instagram with captions announcing the festival. This created a viral craze on social media, people were immediately trying to learn the details of the event, they were willing to pay large amounts of money to attend, in the efforts to live like the celebrities they follow online. What will be remembered as potentially the most brilliant, millennial geared marketing campaign of all time, was a complete success. They started with the perfect idea, found an incredible venue and followed it up by creating an event full of popular musical acts and various other activities. The buzz that was created took the Internet by storm, and the general admission tickets to the festival sold out almost immediately. Due to this, Fyre created an even more exclusive VIP package, which people also immediately bought. The marketing campaign helped set up what many thought was going to be the next Woodstock-esque event that people would be talked about for years to come. Little did they know; the festival would be famous for a much different reason. Everyone knows the story so I don’t need to rehash it for anyone, but let’s just leave it at the festival never happened, and was a complete disaster from start to finish. From lying about the “private” island location, to the FEMA tents, to being locked in the airport, to the Bahamian employees who still haven’t been paid. It just goes to show that no matter how much marketing you invest in, without a great product and proper execution, you have nothing. It’s proof that marketing (when done right) is so incredibly powerful. It can create just about anything you can dream of, which is exactly what happened for the Fyre festival. Another important lesson of the Fyre Festival is how influencer marketing can be so impactful to your marketing campaign, it can increase the amount of eyes on your campaign by millions (literally) in just a few moments, but on the other hand when this happens people’s expectations are heightened and in this instance the successful influencer marketing campaign completely backfired. Every company needs to have a social media presence regardless if you are a B2B or B2C company. In fact, according to Forbes there are over 50 million business pages active on Facebook right now. That’s a pretty big number, right? It’s also a strong indicator demonstrating how important it is for your company to have (and utilize) social media accounts. Let’s think about it from this perspective: you’re trying to decide where to go out to dinner with friends and everyone gives their recommendation. How do you decided? You take to social media and look at the restaurants Facebook, Twitter & Instagram pages to see which food looks the yummiest. We’re not alone, according to Zizzi, 30% of individuals would avoid a restaurant is their social media presence is weak. Now, we understand that starting and maintaining social media marketing can be overwhelming (that’s what we’re here for) but we thought we’d give a few basics so you can get your business strategy up and running. There’s a reason why business accounts exist. Under no circumstance should people have to “friend” your business instead, they should like your page. The same goes for LinkedIn, creating a company page creates a much better user experience for your clients to keep up with you without having to send an invitation to request. Business accounts make it easy to add your company’s hours, services and so much more helpful info. Most importantly, creating a business account on all platforms allows you to see insights and analytics to monitor the performance of the account and specific posts, allowing you to optimize as you go. When it comes to hashtags there’s a million different studies that will tell you a million different “magic numbers” for the number of hashtags you should use. Truth be told, there is no magic number but we’d recommend going on a site like hashtagify.com and finding popular, relevant hashtags for your business and using those in your posts. Don’t use popular hashtags just to gain traction – it won’t make a different in the long run. Just because there’s an easy-option to do something, doesn’t mean it’s the correct option. This is true of linking your company’s social media accounts. Each platform has their own best practice for how to post and they’re all very different. For example, seeing a plethora of hashtags in a post on Facebook is something that will make your company stand out – and not in a good way. They are not helpful on Facebook because no one is searching for them there, therefore it’s not necessary to use them. However, they are powerful on other platforms! Plus, you want people to follow you on as many platforms as you’re on, so posting the same content at the same time across the board may not be the best strategy. Again, there’s no magic formula for how many posts a week your business should be posting but we’d recommend 3-5 times a week on Facebook and daily on Instagram and Twitter. You want people to keep your company top-of-mind but don’t want to drive them away by being in their face all the time. Make sure your messaging and content are relevant and helpful. This seems simple and for the most part it really is. People love to see people so show off your team and add that human element to your posting. People also love to see food, dogs, babies… you know everything that makes people smile. Remember, social media is supposed to be social. So yes, it is important that your posts are on-brand and coincide with your company’s values and goals but it’s okay to have a little fun as well. Make sure your messaging and content are relevant and helpful. It’s the norm for every post to have accompanying imagery. Studies show posts with pictures get 650% more engagement. Use social media to show case your work! If you’re a salon, use images that show the newest hair style. If you’re a restaurant, show the specials you’re having that night. Try to entice your followers and turn them into loyal clients! So, there you have it, the basic guidelines to using social media as a part of your company’s marketing strategy. If even this guide is overwhelming to you, we should talk. Contact us today for a free social media consultation! Here’s a friendly reminder - the holiday season is long (and seemingly getting longer every year). Therefore, you need to plan for not one post or email, but an entire campaign of different, but cohesive posts to constantly stay top-of-mind to your consumers during the busy and crowded holiday season. Remember, last year on Black Friday when you received approximately 2590385034 emails? This is a perfect example why you need to plan for much more than one email or social post. Most brands have a natural fit for the giving season. This is the time of year to hone in on what you want your brand to be known for. It’s almost a given in this day and age for brands to have some tie-in to a charity, especially during the holiday season. However, it’s important that the charity chosen is an organic fit to the mission of your business. If you’re doing it “just for charity” your customers will realize and the buy-in will not be as beneficial to anyone involved. For example, if you’re in the restaurant industry it might be the perfect fit to form a partnership with a food back. Whereas, if you own a retail shop it could be the perfect tie-in to donate to a shelter that provides clothing to the less fortunate. The tides have turned and people LOVE getting mail again. Rather than being one of the hundreds of emails received on any given day, wouldn’t you love being one of the few things (not bill related) that an individual is getting in their mailbox? Although the amount of mail that is delivered during the holiday season does increase. If you create an amazing, on-brand holiday card it’s not only an additional way to ensure that your brand is top of mind but also a way to showcase your brand and wish your consumers a happy holiday season. Your business is firing on all different cylinders, so your holiday campaign should as well. Email, social, direct mail, digital, print, text, etc. Your holiday campaign should be carried out throughout these different mediums as well. Start by establishing what you want to accomplish (maybe this is a percentage off, a gift card promotion or a buy one, get one offer) and the look of the campaign and then bring that look to life so your consumers will see it over and over and be reminded of what you are trying to accomplish and what action you want them to take. Because People Love Presents, Right? Who doesn’t love to get a present? The holiday season is the perfect time of year to give your clients, prospective clients, friends and family a branded gift that they’ll want to keep, use and hopefully carry with them wherever they go, and can we say free advertising? Sometimes it takes a little time to find the perfect gift to give from your company, but if you nail it – everyone will be talking about it and your brand. This seems like a no-brainer but boy oh boy you’d be surprised how many people miss out on this final step of a holiday campaign. People like to feel special and a simple “Happy Holiday” from your business is another element of making your customers feel like you truly care about them and value them – this can even be through something as simple as a video on social media featuring your team wishing everyone a happy holiday season! We understand just how valuable a holiday campaign can be for a business, but we also understand how much work and time goes into making a holiday campaign a success. There’s still time (barely) to execute a kickass campaign and we’re here to help. Contact us today to get started on your holiday marketing strategy. As you can see, no other restaurants are safe – and not even their own customers can escape the wrath and playfulness of Wendy’s. Now from a strictly marketing perspective, these are the types of the tweets that go viral. Don’t believe me? That burn targeted at McDonald’s had 12k retweets and 28k likes, the average on their four previous tweets that included messaging on their own branding and promotions, was only 1,692 retweets and 11,467 likes. You may not realize exactly what these numbers imply but here’s an easy breakdown. The more a tweet is retweeted and liked, the more it shows up in other people’s timelines. This means there are more people who are seeing Wendy’s logo, messaging and therefore subconsciously begin to crave their food. Wendy’s strategy is simple, go viral and get in front of as many people as possible. In my opinion their “burn” strategy is most definitely paying off! Professional sports are a unique platform to market because not only does each team want to grow and engage their fan base, but the NBA benefits from people being engaged with teams outside of their “home team”. Therefore, when teams interact with one another they’re encouraging their fans to essentially get in on the action. The tweet above from the Raptors was not only retweeted and favorited more than their typical post, but had fans of both teams replying to the tweet “burning” each other. These rivalries lead to storylines, which leads to increased viewership on TV, ticket sales, etc. 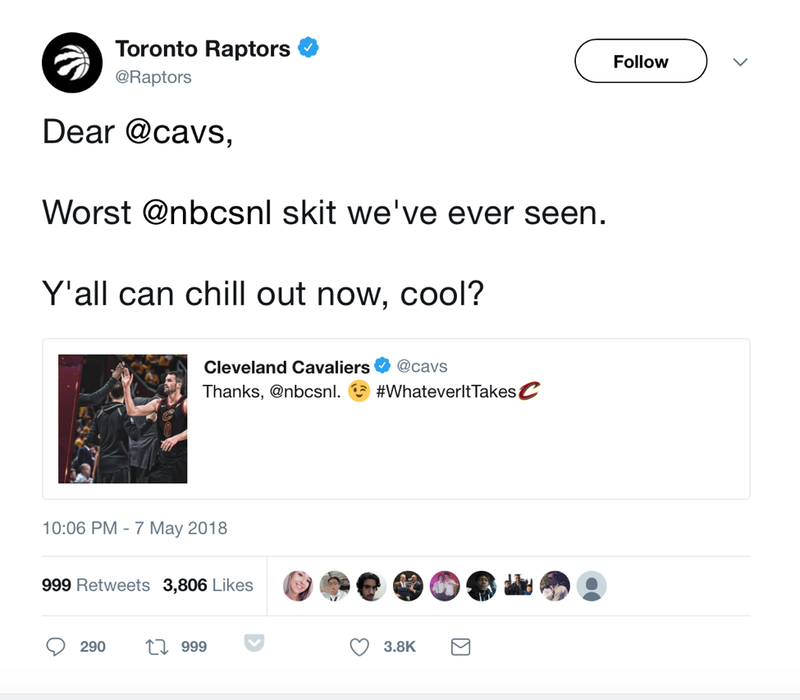 The NBA has captivated on social media and each team interacting with one another (often in burns) more than any other professional sports organization and it shows by looking at their official account. The NBA leads all other professional sports organization in followers with 27.9 MILLION! With the closest organization having 3 million less…let’s hope they keep it up! Hot Pocket’s strategy is to engage their current clientele, more so than it is to go viral. They have a smaller following than the previous accounts featured with 37k but every tweet they post is incredibly engaging. They talk to their fan base in the same ways in which you would communicate with a friend on social media. Here’s why this is so important – when a brand successfully makes their consumers feel important they become another asset to utilize in their marketing strategy. As Jay Baer said, “the goal of social media is to turn customers into a volunteer marketing army,” and in this regard, Hot Pocket’s has truly hit it out of the park. We live in a society where it is almost impossible for businesses and organizations to not utilize, or even have a social media presence. It is called social media because at its core it is social and without the social aspect, it’s just noise to your consumers. So if your brand allows - make it fun! Social media cannot only impact the perception of your business but also help enhance overall growth and revenue. Don’t have the time that’s necessary for creating fun and captivating content that will continue to move your business forward? That’s what we’re here for! Contact us today for a free consultation. Social media has provided brands with the opportunity to be viewed by their consumers in a different way than ever before. They can now get in front of their customers in an approachable way to remain top of mind with every post they share. Here are some brands who are utilizing Instagram to stay relevant to their core followers while also bringing awareness to potential consumers. Everyone has seen an amazing (usually adventurous) video that has been filmed using GoPro. The tech company invented a camera that is built to be waterproof and withstand any damage that would have prohibited that thrill-seeker from capturing their journeys on film for the world to see. Due to the nature of their business, it should be no surprise that GoPro is at the top of this list. What They Do: With 13 million followers on Instagram from across the world, GoPro utilizes their best asset (their customers) to sell their cameras. The GoPro Instagram feed is full of amazing pictures and videos that were taken using their cameras. Trust us, each picture will give you that feeling of wanderlust that just might inspire you to purchase a GoPro of your own. Why They’re Killing It: User-Generated content! Not only does GoPro show you the best images and videos that were captured by the product they are showcasing but they do it by highlighting pictures and videos sent to them by their best spokespeople, their users. Each day, GoPro shares either a “Video Of The Day” or “Photo Of The Day” where they share posts that were submitted to them on the platform, this not only engages their audience and consumers but also provides GoPro users with an incentive to take that next adventure (with their GoPro) and submit their own footage! Moleskine started by selling their classic notebooks, which are insanely popular (the Elysium team even uses them). The brand has evolved and now carries an entire line of office supplies as well as bags and accessories. The products are high-quality, affordable and even customizable – one reason why this brand has become a fan favorite. Why They’re Killing It: The real beauty to Moleskine’s Instagram is when you look at their feed in the grid format. Instagram breaks down their layout so you see three photos on each line of the grid. Moleskine takes advantage of this and posts 3 pictures in a row that are complimentary to one another – they’re essentially a picture within their profile which allows the brand to show an image in two different formats to their followers. Scrolling throughout a person’s daily feed they see beautiful pictures of the Moleskine products, but upon checking out the company’s profile they are also treated to a thought out, cohesive feed that showcases exactly what Moleskine is helping their consumers achieves – organization! Lush is a beauty and cosmetic brand, priding itself on their “homemade” products that are natural, organic and produced cruelty-free. Their products are colorful, smell amazing and are a hit across the world, so much so that they have gathered a group of followers who have become some of the greatest spokespersons for the brand itself. What They Do: Lush creates fun products so it is only fitting that their feed is full of beautiful, colorful posts that highlight exactly what their products are made for - fun. The majority of their feed is focused on their bath bombs, which is their #1 top seller allowing Lush to showcase bright photos and videos of their fun bath bombs. For example, they show a video of their rocket bath bomb dissolving in a tub – SO COOL and makes you want to order 1 (or ten) as you’re scrolling through your feed. Why They’re Killing It: The true reason Lush made this list of a brand who absolutely thrives on Instagram is because of their comment section (weird, I know) but Lush has a team who replies to every relevant comment on their posts on the platform. This is a huge part of Lush maintaining their insanely loyal customers. Here’s an example: @healthybalancedblonde commented on a post and said “What is this one??? I needed!!! !” Now typically, larger brands would ignore a comment like this or maybe “like” it so the customer felt important but not Lush. Rather, Lush responded that same day tagging the previously noted customer – “This is our ever-gorgeous Tisty Tosty bath bomb, Morgan! – Meghan” Now, not only does this customer feel like they are getting to know the brand they buy from by the employee adding her name to the comment, but also, she took the time to click on the customer’s page and learn her real name. This personalized touch goes a long way and has helped Lush grow to having 3.9 million followers. Okay, so who doesn’t love ice cream?! Halo Top Creamery is gaining popularity for being the world’s first all-natural light ice cream, and due to that, supermarkets can’t stock the freezer aisles with these pints quickly enough. Each pint is under 350 calories for the ENTIRE pint and thus ice cream lovers and health-enthusiasts alike are championing this brand. What They Do: Halo Top highlights their product in fun, innovative ways that excite their followers. Let’s be honest, they’re working with one of the yummiest products that automatically provides their consumers with joy. However, the brand consistently highlights their products in new enthusing ways by often incorporating the “ingredients” for the flavors of ice cream. Their captions are also fun, uplifting, and often full of puns which truly fits with the tone of this brand. Why They’re Killing It: Halo Top just gets it, their posts are fun on-brand and they always make me want to go out and buy a new flavor of their product line. They are also masters of new product launches. Here’s what they did before they launched 7 new flavors this month. Each day for a week, the brand posted a picture of an object indicative to the flavor of ice cream that corresponded with a number. For example, on day 6 they posted a 6 made of cinnamon rolls to introduce their new Cinnamon Roll ice cream. Then, on day 7 they posted all 7 new flavors in one group shot. Shinola is a USA made leather company from Detroit who got their start only 5 years ago by selling watches with a goal of bringing American jobs back to the city. Since their start, the brand has escalated into selling high-end leather goods, jewelry and accessories. What They Do: Shinola shows off their high-end products in a way that truly makes you want to purchase from the company. They utilize the “Link in Bio” feature so followers can easily link out of the app and go straight to the product they’re eye-ing up and make that purchase immediately. This is currently the best user-experience an e-commerce company can provide to their customers on Instagram, and Shinola is executing this perfectly. Why They’re Killing It: The story behind Shinola is an important piece of the company’s identity and therefore is an important piece of their presence on Instagram. 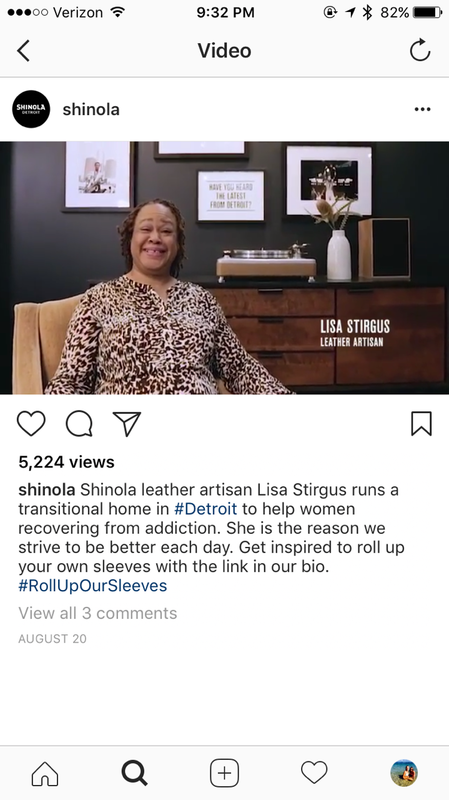 Shinola highlights their team members on Instagram to give followers that personal connection that further allows them to feel as if they know the brand they are buying from. To further expand on showing their identity, Shinola uses #RollUpOurSleeves – throughout their feed you will see this hashtag shared with different pictures and videos. These posts highlight Shinola team members who have gone above and beyond the brand’s mission and brought positive change to the communities in which the members work and live. These feel good, inspirational stories are posted just enough to provide you with that warm and fuzzy feeling but not too often to make it feel overdone. It shows their consumers that they practice what they preach and truly care about the places where they are building factories to help bring jobs to different cities across the country. As Elysium Marketing Group began managing some of our clients’ social media, we noticed that some of the profiles were not aesthetically or topically on-brand. The deeper we dug, the more we saw the companies’ leaders’ personal interests, political preferences, and sense of humor peeking through their accounts. While many brands are built by strong leaders with equally strong points of view, the bottom line is that the founder(s) and the company(s) are two separate entities. Below are five reasons why you should separate your social accounts from your business accounts. 1. Relevance – One of the most important things to keep in mind when planning your upcoming social media strategy is to ensure you’re giving your followers what they’re looking for. If you’re a national jewelry company, most likely your followers are following because (a). they like jewelry, (b). they like your jewelry, and/or (c). they like the fashion/accessory industry. If you personally like baseball as well as jewelry, it doesn’t mean your followers/customers do too. The bottom line is if you start to post too many irrelevant posts that aren’t related to your industry, your followers are likely to unfollow your account, leaving you with fewer people to engage with and market to. 2. Sensitive Topics – Politics are a BIG deal in 2016. Many people have very intense feelings about the candidates, the political parties, and the direction of the United States. While opinions on these topics are plentiful, it’s best to keep them separate from your business or your clients. You don’t want to alienate followers/customers/clients who may have differing views. 3. Sensitive Topics Part II – Politics isn’t the only topic that can divide people. Posting about religion or race is also content that could cause some followers to feel uneasy, plus normally it would not relate to your brand’s business goals. 4. Old Content - We’ve seen people who start a social media account as a personal account, then decide to change the page to a business account. The problem with this is when a follower decides to take a more in-depth look at the company, they could start to see personal photos or irrelevant photos that are separate from the objectives of your business. 5. Security – Most business owners don’t have time to manage their business’ social media profiles. Whether an in-house employee or outsourced social media expert begins to manage the accounts, you don’t want to give your personal passwords out to anyone. It’s better to keep your personal passwords private, but share your business passwords with the professionals or team. What we’re definitely not saying is you can’t have fun on social media. If your brand lends itself to it, have SO much fun. Post fun memes and awesome gifs, but please keep it business related. As the wise Michael Corleone from The Godfather says, “It’s not personal, Sonny. It’s strictly business.” Social media wasn’t around when this movie came out, but we’re pretty sure he’d agree with us that this saying would apply to your social media accounts as well. The Elysium Marketing Group social media interns created a satirical video making fun of ‘The Plight of a Social Media Intern.’ Like most humorous videos and articles, it’s funny because there’s a hint of truth behind it. Sometimes as social media account managers, it feels as if the only way to grow the page’s user base and engage its fans is to ask (or beg) everyone you know (or don’t know) to interact with the page.